Backed by the most trusted and professional name in airbrushes, Iwata Studio Series air compressors are user friendly, powerful and affordable. These compressors bridge the gap by providing the most complete air compressor for an astonishingly economical price. Iwata Studio series compressors feature “Sprint Power” a mightily powerful and reliable oil-less piston compressor that is remarkably quiet! Powerful, compact, reliable and quiet, the Silver Jet us a single-person, light-duty, entry-level compressor. It features working pressure adjustable from 10-18 psi, perfect for cosmetics, tanning, hobbies/models, fingernail painting, bakery and general airbrushing. The Silver Jet includes a coiled airhose, Iwata Pistol-Grip Filter, pressure adjustable knob, handle, airbrush holder, pressure gauge and convenient airhose connector. 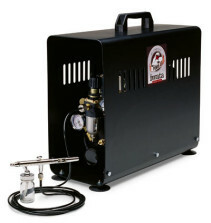 Smart Jet Airbrush Compressor The Smart Jet model features “*SMART” technology and is a great compressor for the occasional and professional artist doing general airbrush applications. The Smart Jet is powerful, compact, reliable and quiet. Iwata Studio Series compressors are absolutely the best value in the world. Power Pro: for a 2 brush operation has Twin pumps with a 1/6hp motor. Also has Duel Moisture traps, Pressure adjustments, Air regulators, Holders, And quick disconnect ports.